The Split View Controller is an iPad specific container view controller for managing two view controllers, a master in the left and a detail on the right. 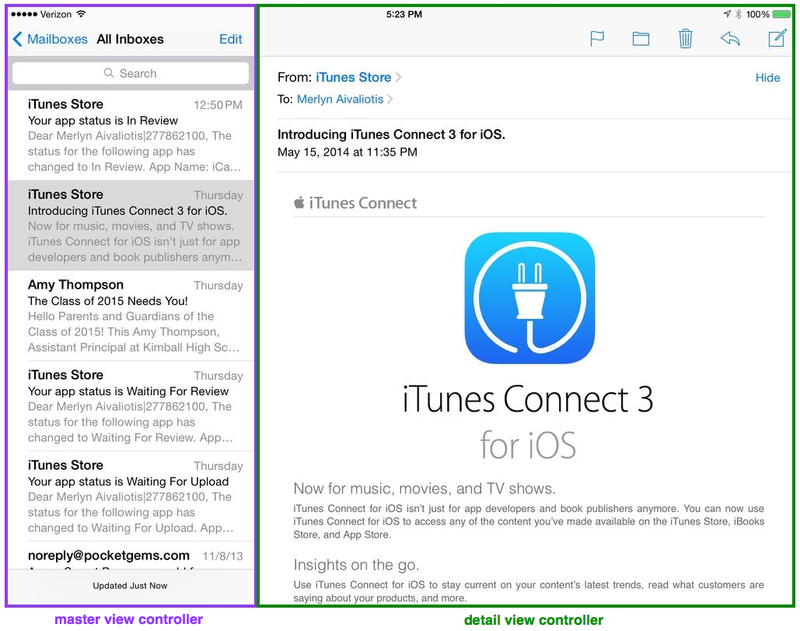 A prime example of the Split View Controller can be seen with the iPad Mail app which list messages and mailboxes in the master panel and displays the content of the currently selected message in the detail panel-see Figure 1 below. If the user put the iPad device in portrait orientation, only the detail view control is shown on screen-see Figure 2 below. The remainder of this tutorial demonstrates the basic use of the split view controller. 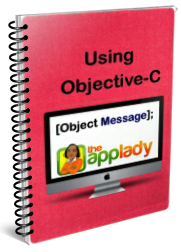 To get started, launch Xcode and create a new project. Select the “Master Detail” application template and set options shown in Figure 3 below for the project. As you can see in Figure 4 below, the template created a storyboard file and three class files in the Project Navigator panel. 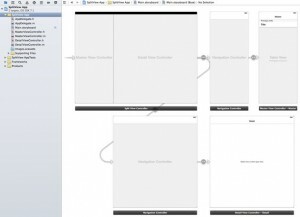 Further more, the template added a split view controller, two navigation controller, and two view controllers (Master and Detail) on the storyboard canvas. 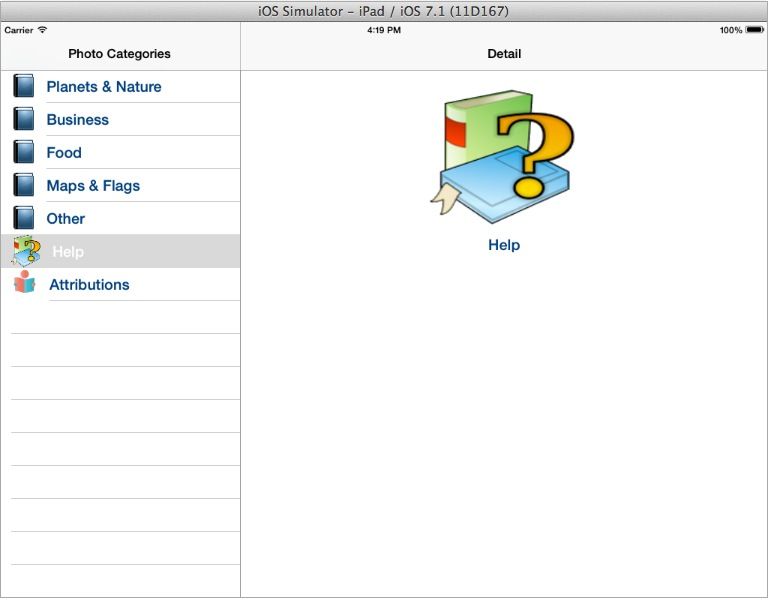 Run the application on the iPad Simulator and you will see output in portrait orientation by default. Switching to landscape orientation, you will see output shown in Figure 6. 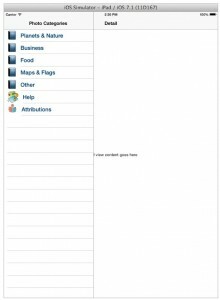 To switch to landscape orientation, select the iPad Simulator’s Hardware | Rotate Left or Rotate Right menu item. 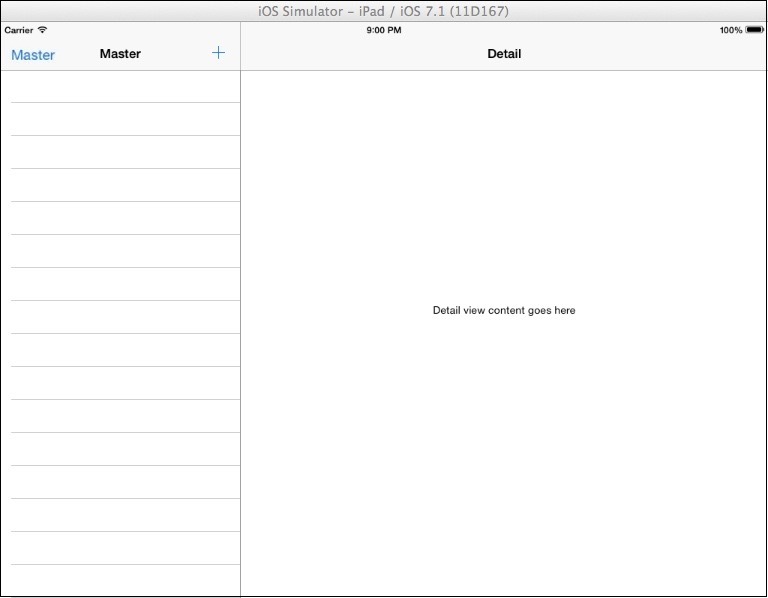 You don’t have to rotate the iPad Simulator to see the Master view; just click the navigation bar’s Master button. To hide the Master view once again, just click anywhere outside the Master view. Here is the code to add in the MasterViewController class files. 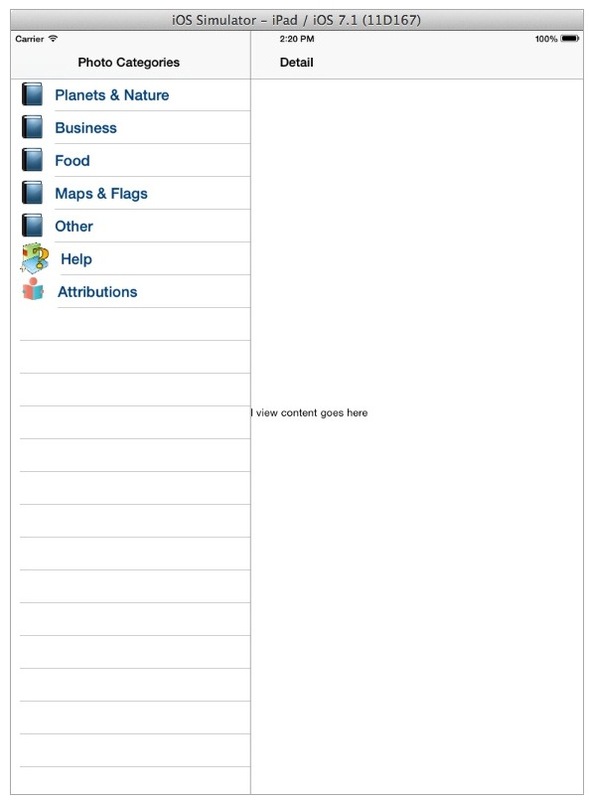 As you can see in Figure 8 above, images are displayed on the Table View cells; so add these images in the project. What we want to do now is change the Detail View navigation bar button’s title property to display, “Photo Categories” instead of Master. All you have to do is change a single line in the DetailViewController.m file’s willHideViewController method. 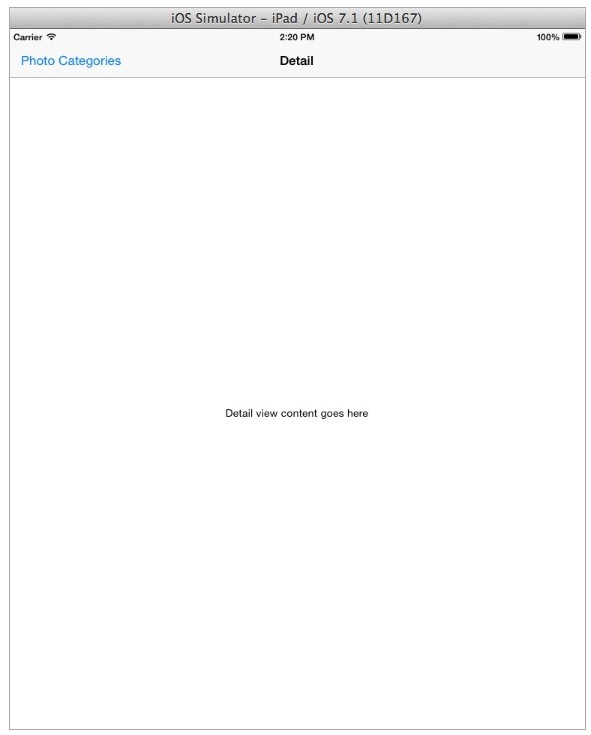 After Performing task 1 and 2, the app should look like output shown in these images. Delete the label control from the Detail View, then add these. Define properties for the view’s controls in the DetailViewController.h file. 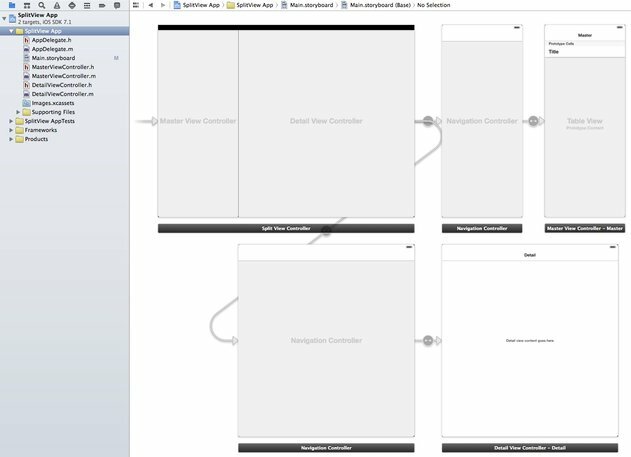 Hook up the view’s controls to their properties in Interface Builder. Set the Label control’s Color property to Ocean, set its Alignment property to center, set its Font property to System Bold 20, and remove default text from the Text property. 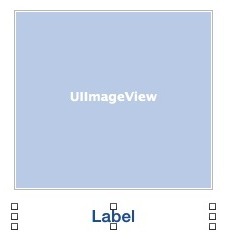 Add this code in the MasterViewController.m file, which display content in the Detail View’s controls. Once you’ve performed above tasks, run the application on the iPad Simulator to test the Detail View interface. 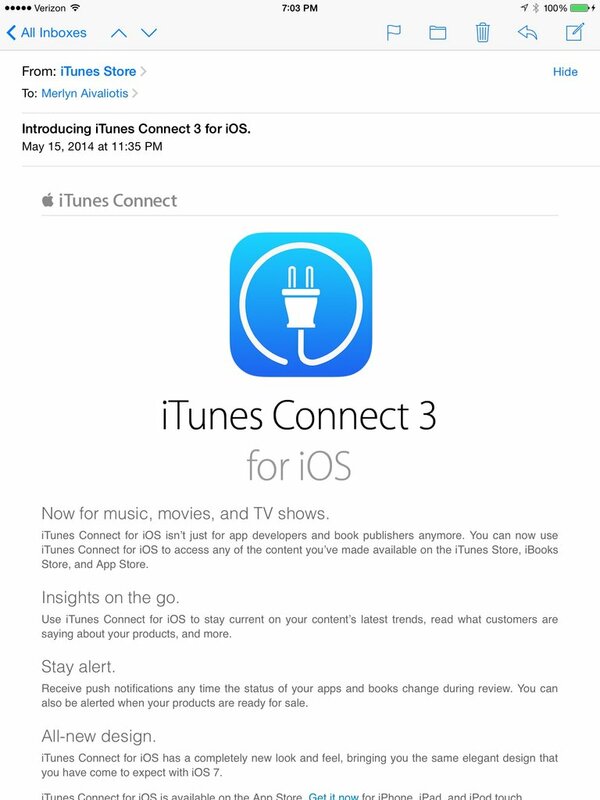 Put the simulator in landscape orientation, then select a Photo Category. 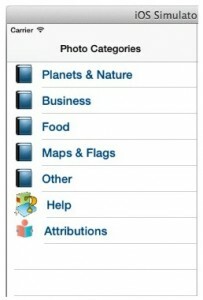 As you can see in the Figure 11, the app display the selected category image and name in the Detail View’s controls. Cool huh? 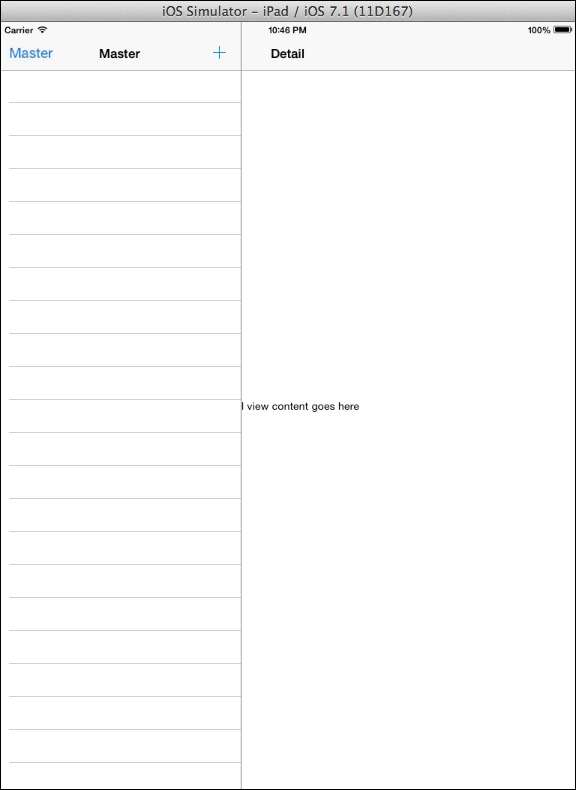 If you want to dismiss the Master View when the user tap a Table View cell, you’ll have to do the following. 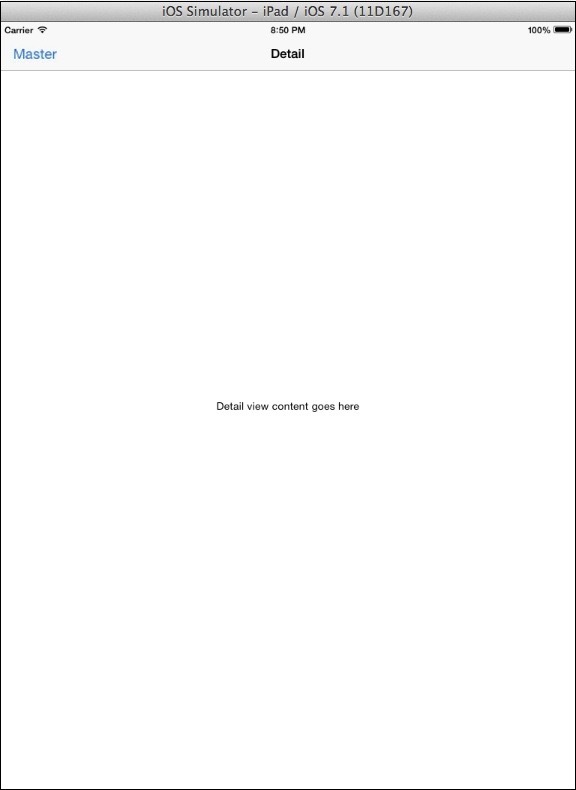 Declare and implement this method in the MasterViewController header and implementation file. Add this statement in the MasterViewController.m file’s didSelectRowAtIndexPath: method. In the DetailViewController.m file, cut the property declaration statement that’s on line 12. Past it in the DetailViewController.h file. After performing above task, run the application and click a cell. 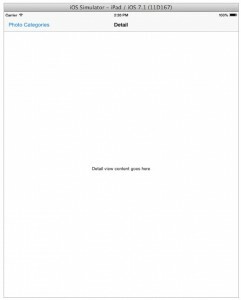 As you can see, the Master View is dismissed. That’s it. 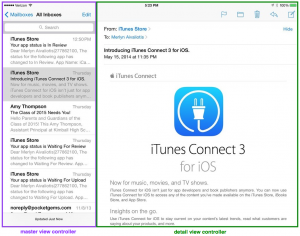 Now you know the basics of using the Split View Controller.